The UK's bestselling monthly magazine, trusted by more than 600,000 subscribers and fighting the good fight for consumers since 1957. From the latest test results of everyday products and services to our in-depth surveys and investigations, each month Which? gives impartial advice and recommendations, the best deals and keeps you on top of consumer news. If you download our app version of the magazine from the iTunes Store or Google Play you’ll also get access to our digital archive and weekly 7-in-7 news and reviews digest. Published every month, Which? Money is the UK's best-read personal finance magazine. Expert, unbiased help and advice for all your money matters, from savings and investments to mortgages, tax and pensions. Money-saving tips and case studies into the finance industry. Unlimited access to our Which? Money Helpline. The UK's largest computing and technology title, published six times a year. Easy, jargon-free advice so you can make the most of your tablet, laptop or smartphone. One-to-one support from our friendly ​Tech Support ​helpdesk team, ready to respond to unlimited member queries. 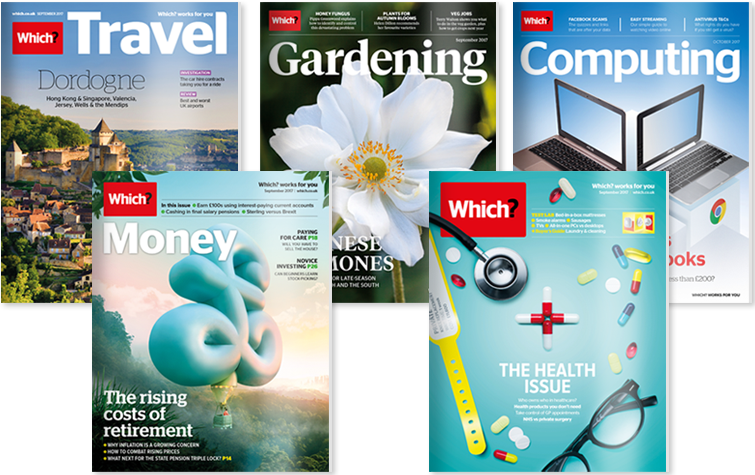 Packed with exclusive reviews, investigations and destination features from the UK’s best travel writers. Insider tips on how to find the best deals and who to book with. Step-by-step phone guidance from our legal experts on how to resolve a travel dispute. The only gardening magazine to rigorously trial plant varieties gardening techniques and products so you can be sure to get the best from your garden. 10 issues a year, packed with seasonal advice about what to do and when. Members can also get free gardening advice from our experts by email any day of the month. Browse through more than 9,000 product reviews to find the best things to buy when you're out and about shopping – click here to find out more about the app and how to download it.